Saving messages for future use is helpful only if you have a system that allows you to locate them. Split the mailbox into File Storage and Inbox. Name your folders to create categories that are useful to you. 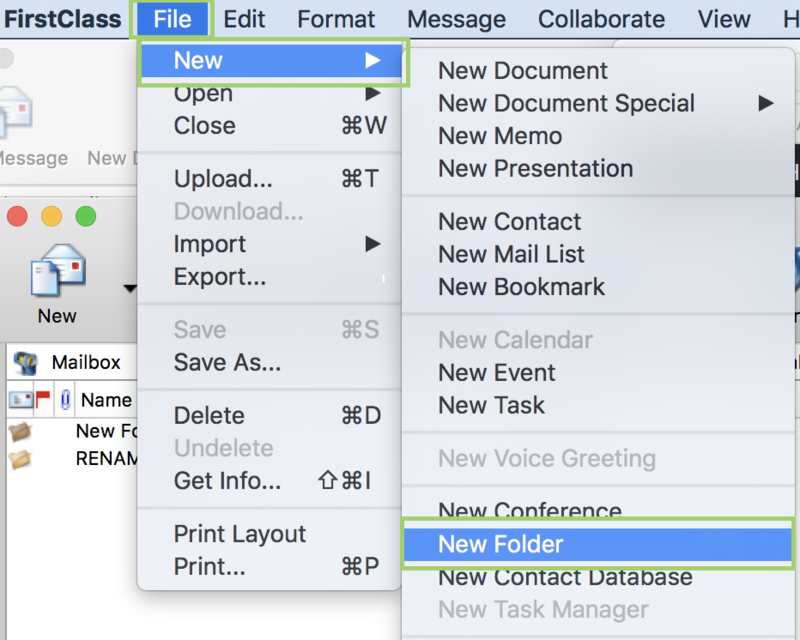 Before you begin creating folders, be sure you click in the portion of the window in which you wish the folders to appear. UNA mailbox Tool bar drop down New then on New Folder. FirstClass menu bar File, New then New Folder. Name new folder. See directions above. You may want to lock folders so they can not be accidentally deleted. If they are locked and you want to Delete folder you will need to unlock. To Lock and Unlock you will need to highlight Folder and click on File, Get Info. The Folders Info screen will open. Click on Protected, when the Check Mark is present it is protected and to remove the Check Mark, click on it and it will be removed. Select the messages you want to place in a given folder by highlighting them. Left–click on a message and drag down to highlight. 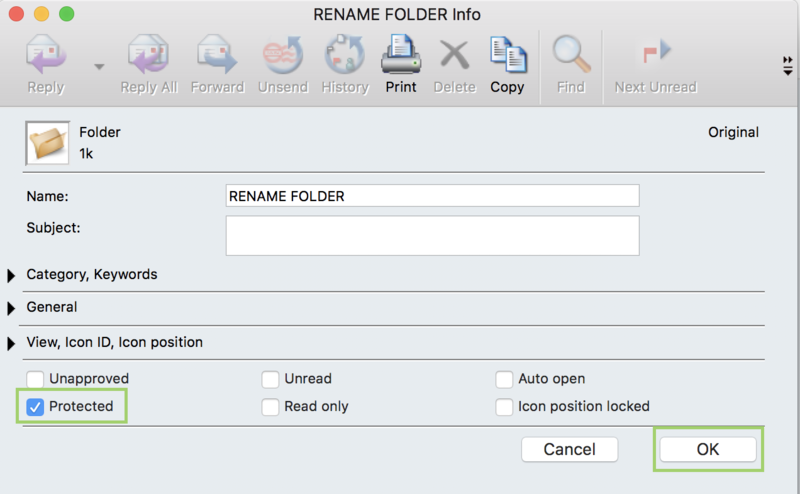 Then move the highlighted message or messages to the folder desired. 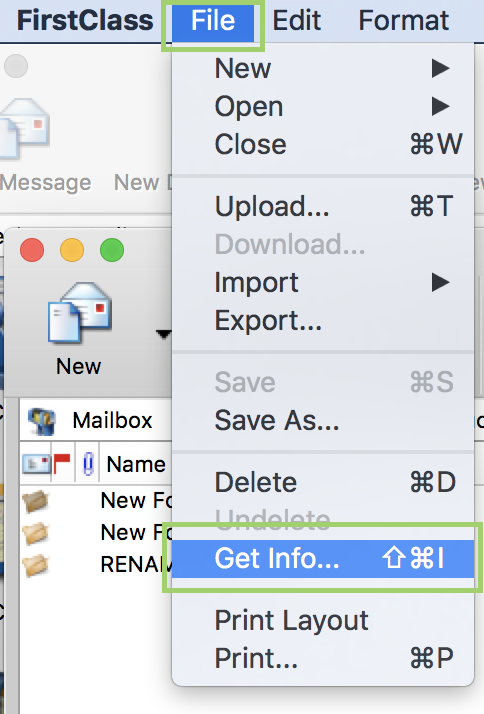 NOTE: If you hold the pointer over a folder it will spring open so you can see the messages appear after you release the mouse button. FirstClass sorts the contents of your window according to the column you selected in List view. Look for the sort indicator (bars), up is for ascending and down is for descending order. Sorting by date – Column of Last Modified needs the sort indicator so the window can display content by date. Sorting by name – Looking for a message from a particular person helpful to sort the list of messages by Name. Message with the word TO in front of name are all outgoing messages. Sorting by Unread – Column with the label of Red Flag shows unread messages. Messages with a white flag are messages that have not been sent. Might be useful to pull all the unread messages into a group for easy reading. Click on the Red Flag column so the sort indicator appears for that column. Using the Filter – Filter works a limited type of search to locate particular messages with in the window. Whatever is entered into the Filter window, only messages containing that character combination will be displayed. The rest are hidden. Remove the Filter to display all messages in Inbox.